Tasting Rooms is a bar and restaurant offering real ale beer and British dishes. Watch the brewers work just meters away as you sit within the working brewery. 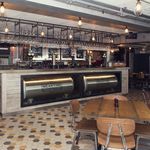 "Born and brewed right here in Greenwich, Meantime Brewing Company are the pioneers of craft beer in the UK. Join us at our new Tasting Rooms for a true modern craft beer experience. You can eat, shop, tour and most importantly enjoy our range of beers all in the shadows of a working brewery." What did you think of Tasting Rooms?